As always, we have our Notable Women in Science series. We cover women in science who have been notable historically and currently. We also have our Double Xpression series which profiles women who are into science. The Royal Society recently had a wikipedia push for writers to start new and expand the pages of women in science. Having visited wikipedia for writing the Notable Women in Science series, I can say that the number of pages created has definitely expanded and certainly there is much more information provided on a number of women. But there are still gaps. Look for more from Double X Science on this topic in the future. 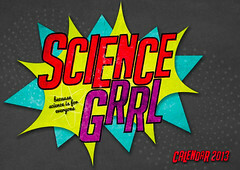 A group in the UK is making a calendar “to showcase real women doing great science.” Learn more about ScienceGRRL by visiting their website and following thier social media. The images being used in the calendar look to be scenic or portrait-style. SpotOn provides some tools for the female scientist to promote herself and also provides links that those interested in science might be interested in following, such as twitter lists of women in science. When researching this post, I found several sites trying to promote women in science. This site provides resources as well as 4000 years of women in science. In addition, they link to many associations dedicated to helping women in science. Geek Feminism has Wednesday Geek Woman posts every Wednesday highlighting women in STEM. The RAISE project has an on-going blog about the issues facing women in science. Please comment: What is your favorite site working to raise the profile of women in science and why? I have found many women scientists to circle on Google+. The most recommended source is the "STEM Women on G+" page, as well as their new community of the same name. "Science on Google+" shares circles of all sorts, where I have found many amazing women to follow. Skepchick (http://skepchick.org) while not solely focused on this is quite good at it imho. And everyone should watch or at least read this (http://youtube.com/watch?&v=1NiCu_n7ej0#!). As a volunteer for the The Women's Engineering Society (WES), I have recently crated a page on their website (www.wes.org.uk) which identifies role models / inspirational women in Science & Engineering. These women are from both the past and present, from many different disciplines and various career stages.